Description! Qmobile is a Pakistani mobile company which provides best quality mobile phones for their users in Pakistan and around the world. nowadays Qmobile is very popular in all over the world due to great features and more than billions of people are using Qmobile. so Qmobile Noir S6 is also a best mobile phone which comes with a lot of features in the market and these features gives more interesting to use Qmobile S6. if you have a Qmobile S6 or S6 Plus and you having some problems during using then don't worry about this process, we have arranged here a simple solution for this problem. 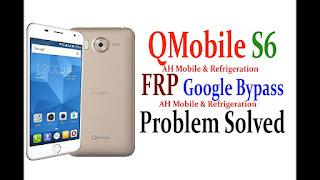 Now we are going to tell about the problem of Qmobile S6 and S6 Plus, if your mobile is showing some problems then you can use Qmobile S6 FRP Bypass Google Account Reset Remove Lock Tool. this is a tool that enables you to Reset, Flash, Remove Pattern Lock and google account verification. Qmobile FRP google account verification is also a Tool like QC FRP Reset Password, Qualcomm FRP Reset Remove, and TR Tools, etc. thanks for choosing our website for downloading Qmobile S6 and s6 Plus FRP Tool. we have placed Qmobile FRP Tool Reset original, direct and safe links at the bottom of this page, don't care about the viruses and threats, etc just click on the given link then automatically start downloading. if the download links don't work properly or you are facing any other difficulties during the downloading or installation process feel free to ask us any question or tell us your problem through comments from below given box.